October 29 – November 3, 2017: Workshop on Advanced Topics in EM Structure Determination: Challenges and Opportunities. Between October 29 and November 3, 2017, the National Resource for Automated Molecular Microscopy held the seventh in a series of workshops in cryo-electron microscopy. The course was originally established as a hands-on teaching conference in 2003, and has evolved into an intense, high-level workshop focused on the discussion of cutting-edge issues. 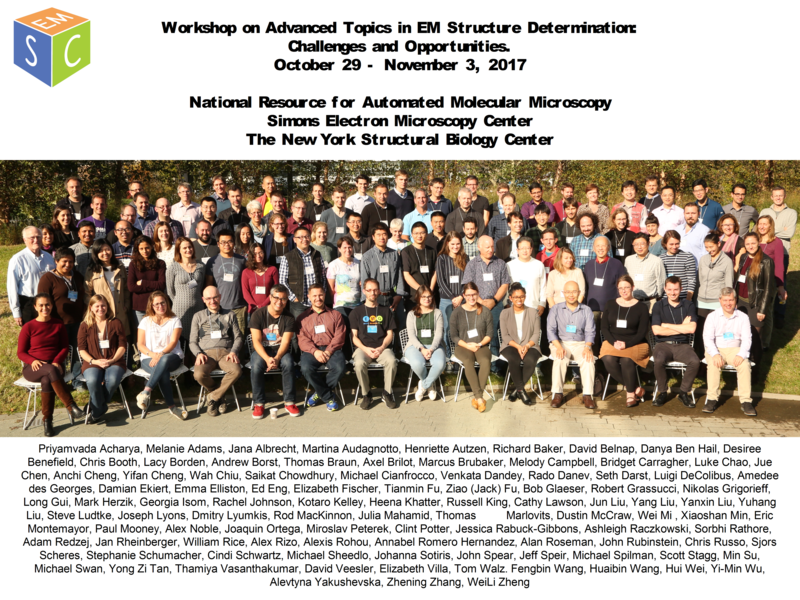 This year, the goal of the workshop, “Advanced Topics in EM Structure Determination: Challenges and Opportunities”, was to discuss the current progress and future prospects of cryoEM in light of recent breathtaking progress, often described as the “Resolution Revolution”, and recognized in the awarding of this years Nobel Prize in Chemistry. Topics discussed at the meeting included specimen preparation (generally thought as being one of the major remaining bottlenecks for the field), image acquisition (including phase plates and next generation direct detectors), image processing and reconstruction (presenters included all of the major developers of software commonly in use), and methods for validation (of very high interest to the community). The final morning of the workshop was primarily aimed at relative newcomers to the field and focused on the practical aspects of doing cryoEM, and setting up a lab. The basic format of the course is to start the day with extended and intense lectures that broadly cover the theme of interest, followed by shorter, more practical lectures in the early afternoon, and then by panel discussions, and demonstrations, an early evening poster session, and an after dinner research talk. The instructors and organizers for the course included: Thomas Braun (Basel), Marcus Brubaker (Structura Biotechnology), Bridget Carragher (NYSBC), Jue Chen (Rockefeller), Anchi Cheng (NYSBC), Yifan Cheng (UCSF), Wah Chiu (Stanford), Michael Cianfrocco (Michigan), Rado Danev (EMBL), Ed Eng (NYSBC), Jack Fu ( Columbia), Bob Glaeser (LBL), Niko Grigorieff (Janelia), Mark Herzik (TSRI), Jun Liu (Yale), Steve Ludtke (Baylor), Dmitry Lyumkis (Salk), Julia Mahamid (EMBL), Thomas Marlovits (Hamburg), Paul Mooney (Gatan), Alex Noble (NYSBC), Joaquin Ortega (McGill), Clint Potter (NYSBC), John Rubinstein (Toronto), Chris Russo (MRC/LMB), Sjors Scheres (MRC/LMB), Scott Stagg (Florida State), David Veesler (U. Wash), Elizabeth Villa (UCSD), Tom Walz (Rockefeller). A total of 101 people participated in the workshop (limited by the size of the lecture theater) and there was a long waiting list. Participants included senior and junior scientists, graduate students and postdoctoral fellows. The participants were drawn from a wide geographic area (including the US, Austria, Canada, Czech Republic, Denmark, Germany, Sweden, Switzerland , Taiwan, UK). Approximately 35% of the participants were women. The overall success of the course was due in large part to the outstanding quality of the lecturers and the participants. We were once again fortunate that many of the most eminent researchers in the field of cryoEM agreed to volunteer their time and effort in a variety of ways. Most of the instructors stay for the full length of the course and interact closely with the participants throughout; the participants consistently place very high value on this aspect in the surveys. A summary of some of the feedback from the participants survey is attached as an appendix. We also attach the final agenda and a full list of participants. As was the case for the previous training courses, the presentations from the 2017 course have been made available on the web in the form of slides accompanied by audio files of the lectures (see: http://nramm.nysbc.org/2017-workshop-lectures/). This is a very effective means of distributing this material that now serves as a general resource to the community as well as a refresher for the students if they choose to revisit the material. Financial support for the workshop was provided by generous support from the Simons Foundation (349247), National Institute of General Medical Sciences (GM104946), The Agouron Institute, Thermo Fisher Scientitic, Gatan Inc., Direct Electron, and TTPLabtech.